New York is a big state filled with big industries, big dreams and big personalities. For those of us lucky enough to live in Syracuse, there’s plenty of culture to keep us proud of our city. From Syracuse University to Clark Reservation State Park, Rosamond Gifford Zoo to the Everson Museum of Art, there’s always something more to explore. Then again, you might not feel so lucky if you are dealing with excessive debt. Truth be told, you might not be the only one feeling this way. About 80% of Americans are in debt. And New York City, just a few hour’s drive away, ranks seventh nationally for the highest credit card balance per capita in the United States. If your debt is becoming unwieldy, then you might be interested in debt relief services. While there is no cure-all to financial problems, there are solutions that can match your unique situation and put you on the path to recovery. As mentioned above, there are a variety of debt relief options available to Syracuse residents. These can address debts large or small, singular or numerous. If you have questions about which solution might best fit your unique financial situation, call 800-910-0065 to talk with a certified debt consultant. A free resource that connects you with a credit counselor. This debt expert can help you navigate your finances to build a better budget, address debt, see or improve your credit score, find educational workshops and resources in your area, and more! It’s a good solution for those looking to improve their financial situation before it gets out of hand. When reviewing your personal financial situation, a credit counselor might notice that your debt needs a little extra oomph to keep things in check. If this is the case, he or she might recommend you enroll in debt management program. As the name implies, these programs help you address and pay off delinquent credit card and personal loan debt. DMPs assist debtors by helping to manage outgoing monthly payments so you can actually make progress on what you owe. In some case, you may be able to negotiate with your creditors to lower the total owed. Companies like Freedom Debt Relief can help with these negotiations. In fact, the organization has resolved over $9 billion in debt since 2002. Keep in mind that any settled debt is considered as income by the IRS, which means you are responsible for the taxes owed. Wrestling with more than $10,000 in debt? Struggling to handle calls or requests for payment from multiple lenders? While your debt may feel like a heavy load you can never escape from, the truth of the matter is that you do have options. One of the most popular options for Syracuse residents is debt consolidation. By consolidating all your debts and paying them off with a debt consolidation loan, you can make your pursuit to financial recovery more feasible. Yes, it’s just easier to pay down a single loan that many. In some cases, your consolidation loan might have a better interest rate or will even forgive a portion of your debt. Of course, there are some things to consider before jumping into a debt consolidation program. These include negative consequences on your credit score, a requirement to leverage high-value assets such as a home, or tax responsibilities associated with debt forgiveness. While debt consolidation won’t be right for every Syracuse resident, it can be a major help to those who need it. When people think about bankruptcy, they might be under the assumption that it is a “clean slate” solution to their financial problems. Unfortunately, this isn’t the case. While Chapter 7 and Chapter 13 bankruptcy can address and alleviate overdue credit card debt, personal loans, medical bills and more, it will also have unfavorable repercussions on your credit score. This can prevent you from being able to buy a home, open new lines of credit or take out personal loans in the future. Take some time to review other debt relief options before deciding to declare bankruptcy. There might be a better solution to getting your personal finances back on track. While the above guide is helpful for understanding the different debt relief options available to Syracuse residents and New Yorkers, the best way to understand the right solution for you is to call 800-910-0065 to speak to a certified debt expert. 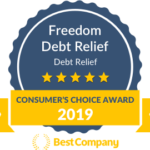 Freedom Debt Relief debt consultants offer free, no-risk advice for New Yorkers like you. Have questions? Call us at 800-910-0065.